about this book: We are sure that our manual for writing novels, short stories, articles, and other non-fiction genres will become the most influential book of this century. We use the writing of major writers and follow Saint Augustine's advice: write by imitating master writers. So, don't—for a minute—expect a "How to" traditional guide to writing prose. 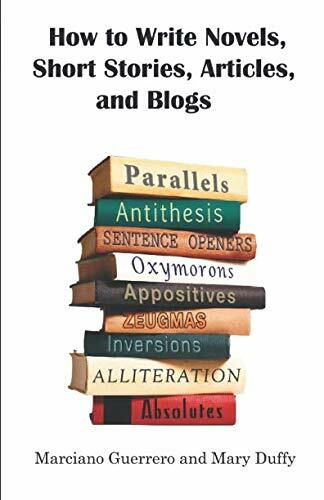 You won't find the quaint ideas and easy classes that theorists have compiled over the years: voice, dialogue, setting, theme, genre, plot, climax, dénouement, character, motivation, flashbacks, point of view, essays, précis (summaries), etc. Nor will you find grammar and syntax rules or a treatise in style. Instead, you will find in this work a clear discussion of ideas of what takes to write agile prose. Ideas that great writers use to their advantage. That is what makes them great writers. This guide sets a unique approach to the writing of riveting prose; an approach that isn't found in any of the traditional books published by theorists, successful and unsuccessful writers, as well as writers' workshops, and writers' conferences. This guide will not only motivate you to start writing but will inspire you to achieve excellency!